Quinoa (pronounced Kinwa) is a gluten-free grain-like protein. It is packed with an essential amino acid balance similar to that of milk. For this reason, it is an excellent source of nutrition for infants and children. Besides its unique protein, quinoa also provides starch, sugars, oil (high in essential linoleic acid), fiber, minerals, and vitamins. It is easy on the stomach since it is light, tasty and easy to digest and not at all heavy like most other grains. It has a delicious flavor all its own. Quinoa is extremely versatile, and can be used in almost any recipe, from soup to salad. Or, you can even eat it on its own! 1/2 can of Italian tomato sauce or any type of canned tomatoes of your choice. Spices: 2 tsp ground cumin, 1 tsp ground pepper, 1.5 tsp salt, 1 tsp chilli powder. 1. Soak Quinoa for 10 minutes to remove any bitterness. 2. 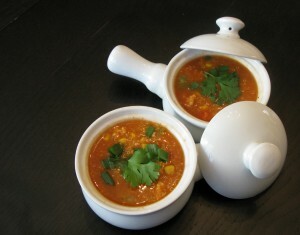 In a separate pan, heat 3 cups of water and add sweetcorn, green pepper, carrots, celery, ginger and the canned tomatoes. 3. Add the spices as indicated above. 4. Drain the Quinoa and add to the soup. 5. Let the soup simmer for 20 minutes on low to medium heat. You will see the Quinoa “uncurl” when cooked. 6. Turn off the heat, add spring onion, cilantro/coriander leaves and lime juice (if using lime juice). Recommendations: Best served immediately. Serve with crusty bread or cornbread for a real treat! Recipe submitted by Payal Vithlani. Image by Sabina Huq.